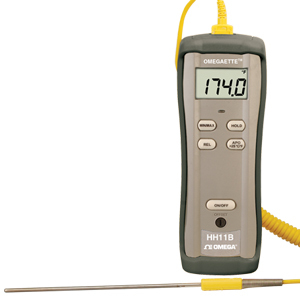 The HH11B and HH12B handheld thermometers feature Type K thermocouple inputs and are available in either single or dual input models. The HH11B is a single-input model that has auto range resolution of 0.1 or 1°. The HH12B is a dual-input meter that allows the user to display T1, T2, or øT (T1 - T2) readings with 0.1 or 1° resolution. Both models are °C/°F switchable and feature front-panel offset adjustment and maximum reading/display hold functions. Capable of measuring temperatures from -200 to 1372°C (-328 to 1999°F), these low-cost meters accept any Type K thermocouple with a mini plug. Noter: Comes with meter, rubber boot, 9 V battery, appropriate number of beaded wire thermocouples and operator’s manual. HH11B and HH12B accept the standard SMPW-type mini thermocouple plugs only. These units are not compatible with NMP connectors.